Are you in the market for new homes for sale in Burleson? Burleson is a rapidly growing city, located just south of Fort Worth. As a family-oriented town, there are over a dozen parks for families to enjoy as well as an outstanding school district. Many also find high appeal in the easy proximity Burleson has to the metroplex. Anyone visiting this quaint Texas town can see why Burleson is becoming an increasingly attractive option for homeowners. Bluebird Meadows – New Phase Coming Soon! Come home to convenience, value and style. Ideally located just minutes from the new Chisholm Trail Parkway, enjoy quick accessibility to all things work and play. This intimate enclave of only 35 homesites will offer eight energy-efficient floor plans. 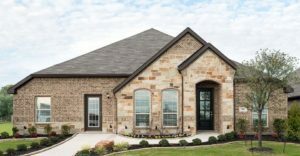 If you’re in the market for new homes in Burleson, TX, our team at Impression Homes can help get you into the property you’ve always dreamed of. You will work alongside leaders in the industry to find and purchase a home that’s built to last for years to come. Your family can create memories in your new home, which was designed specifically with you in mind. At Impression Homes, we work hard to provide you with the best in customer service, while paying attention to even the smallest of details. Regardless of what it is that you desire from new home builders in Burleson, TX, Impression Homes will make sure you receive it. At Impression Homes, we will work with you to design the perfect floor plan to accommodate your whole family. It doesn’t matter if you’re looking for a three-bedroom home or if you need a larger, five-bedroom home, because we are able to personalize floor plans to capture everything you and your family need to bring your home to life. We understand that choosing the perfect floor plan and community can be overwhelming, but that is why our team of trained professionals are here to help you in making any tough decisions throughout the entire process. If you need a home to move into right away and don’t want to wait for a new home to be built, we also offer homes that are ready for a quick move-in. These homes have already been built, and they are simply waiting for someone to move in! By making the decision to purchase one of these homes, it won’t take long before your entire family is living in their new place. Check Out Our Quick Move-In Homes! Impression Homes works hard to provide you with the absolute best quality we can as a new home builder. From timeless design choices, exceptional craftsmanship, a vast array of features and name-brand materials to complete the home, you can rest assured your property is going to last a lifetime. Our energy-efficient options help to reduce the amount of money you are going to spend every month on your energy bill, all while living an eco-friendly lifestyle in the process. To learn more about what we can do for you in Burleson, TX, contact us today! We can help you take the right steps on the path to home ownership and simplify the process for you. All it takes is a few minutes to give us a call. Let us go to work for you and help you acquire a new home today!